You're in: Salmon Conservation and Restoration > Lake Washington/Cedar/Sammamish Watershed > Plans, Studies and Maps > Progress Report 2006-2015 > Are our actions working? 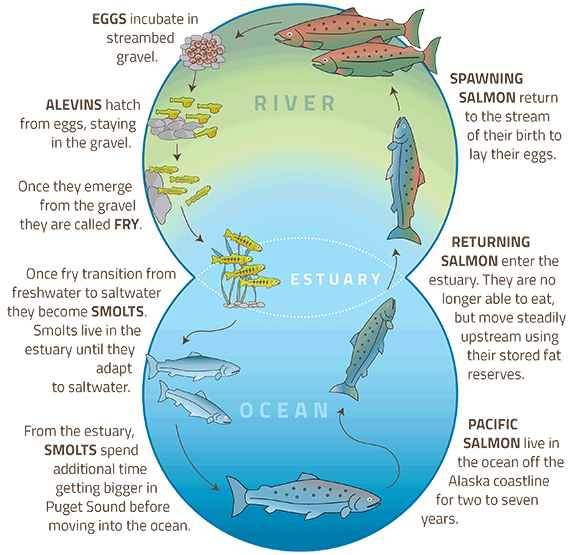 Ten years is a very brief period in salmon recovery time. Salmon advocates must secure funding for restoration, acquire property from willing sellers, and mobilize construction resources within a short building season. Completed projects may take years to mature, as plants take root and grow. Many projects must be coordinated and combined in this manner to have an ecological effect. And after all that, effects on a given cohort of salmon may not be detected until four years later, when they return as adults to spawn. Therefore, even under the best of circumstances, 10 years is not much time to expect measureable results for salmon recovery. Fortunately, planning and implementation of salmon recovery actions in WRIA 8 began well before 2005. Many partners had worked to protect and restore salmon habitat in the watershed as early as the mid-1990s, and some long before that. In addition, agreements such as the Cedar River Habitat Conservation Plan (2000) helped preserve and restore habitat in critical areas for our highest priority Chinook population. Because of these and many more habitat protection and restoration actions, we are beginning to see some signs of progress. The WRIA 8 Technical Committee collects information on Chinook population status and habitat conditions to gauge whether our actions are resulting in a trajectory toward Chinook recovery. These monitoring efforts are essential to salmon recovery as we determine whether course corrections are necessary (i.e., adaptive management). The following sections summarize information we have compiled to date. ‡‡ = Updated adult productivity data not available at time of printing; juvenile productivity data from WDFW.